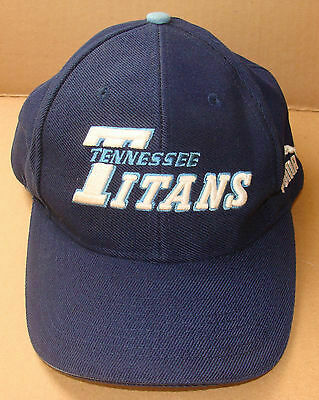 This is a Tennessee Titans Hat Cap that was used once at one game. It is in very nice used condition. Football NFL One size fits most. The Cap is blue. All designs are embroidered stitched. It has a Velcro back strap adjustment for a good fit. It has been stored since it was purchased. Some of the hats I have are a little dusty from storage. Use a soft brush or damp cloth to remove any light dust or put them in the washing machine if washable for a used or softer hat. Follow cleaning, washing instructions if their are any. This hat is new without tags. EVERYTHING THAT I SELL IS DESCRIBED TO THE BEST OF MY KNOWLEDGE.